For centuries slavery reigned in parts of America, forcing an entire people into a lifetime of suffering and servitude. Living under the thumb of this oppressive system, young Harriet Tubman prayed ceaselessly that she and her family would be set free. Little did she know, God would use her and her resolute faith in Jesus to rescue not only her own family, but hundreds of other enslaved African-Americans as well. Discover how Harriet became the "Moses of her people," obeyed God and persevered despite seemingly insurmountable obstacles in this latest episode of the Torchlighters. Torchlighters: The Harriet Tubman Story was published by Vision Video in March 2018 and is our 9122nd best seller. The ISBN for Torchlighters: The Harriet Tubman Story is 727985017617. 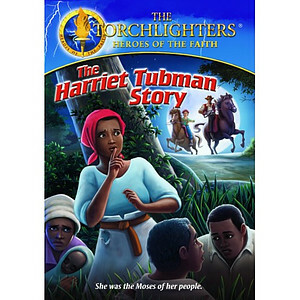 Be the first to review Torchlighters: The Harriet Tubman Story! Got a question? No problem! Just click here to ask us about Torchlighters: The Harriet Tubman Story.